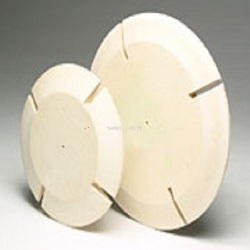 Manufacturer of a wide range of products which include felt split flap wheels. Owing to our expertise in this domain, we are offering our clients a supreme quality Felt Split Flap Wheels. The offered flap wheel is valued for its high grade quality and durability. Additionally, our quality controllers check this flap wheel for dispatching the flawless range. Moreover, this flap wheel can be obtained at nominal prices within a stipulated period of time.